While there is no shortage of eating establishments on Manhattan's upper westside Columbia University area, few are worth even their moderate prices. 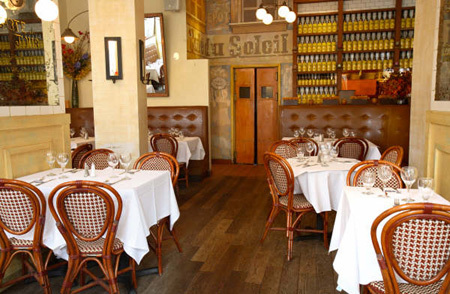 Caf� du Soleil, located on Broadway and 104th Street, is among the few exceptions. The kitchen, under the supervision of chef/owner Matthew Tivy, sends out consistently reliable, generously portioned French-Mediterranean bistro fare. The steak tartare is the real thing - perfectly seasoned, good quality ground sirloin with capers, raw egg and anchovies. A tasty grilled steak with crisp shoestring fries is rare as requested and the large mound of moules marinieres spankingly fresh, plump and juicey.A salad frisee is properly dressed and the wines, by the glass or bottle, reasonable. The mixed crowd - neighborhood families, couples and students - seems consistently cheerful and content even with the sometimes harried staff which although good natured are not always as attentive as one might wish. There's low key entertainment some nights, often with neighbors pitching in. All in all, a big plus for a neighborhood that could use more like Caf� du Soleil.